The official name of Burma is the Republic of the Union of Myanmar. Burma is a sovereign state located in Southeast Asia. Its official name is the Republic of the Union of Myanmar, often informally shortened to "Myanmar". Burma is bordered to the west by Bangladesh and India, to the north by China, and to the east by Laos and Thailand. It has a 1200 mile (1930 kilometer) southern coastline that bounds the Bay of Bengal in the north, and the Andaman Sea in the south. The Ayeyarwady and Salween Rivers empty into the Gulf of Martaban. The country has hundreds of offshore islands, the largest of which are Ramree and Cheduba. Most of Burma's islands are located in the Mergui Archipelago. Google Earth is a free program from Google that allows you to explore satellite images showing the cities and landscapes of Burma and all of Asia in fantastic detail. It works on your desktop computer, tablet, or mobile phone. The images in many areas are detailed enough that you can see houses, vehicles and even people on a city street. Google Earth is free and easy-to-use. Burma is one of nearly 200 countries illustrated on our Blue Ocean Laminated Map of the World. This map shows a combination of political and physical features. It includes country boundaries, major cities, major mountains in shaded relief, ocean depth in blue color gradient, along with many other features. This is a great map for students, schools, offices and anywhere that a nice map of the world is needed for education, display or decor. 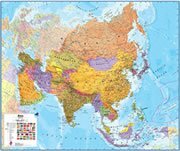 If you are interested in Burma and the geography of Asia our large laminated map of Asia might be just what you need. It is a large political map of Asia that also shows many of the continent's physical features in color or shaded relief. Major lakes, rivers,cities, roads, country boundaries, coastlines and surrounding islands are all shown on the map. Amarapura, Bago, Bhamo, Chauk, Dawei, Hinfhada, Hopin, Insein, Labutta, Laza, Magway, Man Aung, Mandalay, Mawlamyine, Meiktila, Mogok, Mong Pan, Monywa, Moulmeingyun, Mu Se, Mudon, Myeik, Myingyan, Myitkyina, Namtu, Naungpale, Pakokku, Paletwa, Pathein, Phyarpon, Pinleibu, Putao, Pye, Pyin U Lwin, Pyinmanaa, Pyu, Shingbiyang, Shwebo, Sittwe (Akyab), Tangyan, Taro, Taunggyi, Taungoo, Tazungdam, Thandwe, Thaton, Thayet, Thingangyun, Thongwa, Toungoo, Warazup and Yangon. Andaman Sea, Andrew Bay, Arakan Yoma, Ayeyarwady, Bago Yoma, Bawmi Bay, Bay of Bengal, Bilauktaung Range, Cheduba Strait, Chin Hills, Chindwin River, Combermere Bay, Danson Bay, Gulf of Martaban, Gwa Bay, Hunters Bay, Kumon Range, Mangin Range, Mouths of the Ayeyarwady, Myitha River, Ngayok Bay, Nmai River, Patkai Range, Salween River, Tanen Range and Taungnyo Range. Burma's metal resources include tin, antimony, zinc, copper, tungsten and lead. Other resources include petroleum, timber, coal, marble, limestone, gemstones, natural gas and hydropower. Burma is subject to periodic droughts; however, flooding and landslides are common during the rainy season (June to September). Other natural hazards for the country include destructive earthquakes and cyclones. The country of Burma, in southeastern Asia, has industrial pollution of air, soil, and water. There is inadequate sanitation and water treatment, which contributes to disease. Another environmental issue for Burma is deforestation.